I was a bit unsure going into this one, as many reviews I’d read about Three Parts Dead contained phrases like “acquired taste” and “you’ll either love it or hate it”. I actually neither loved nor hated it, but found it fun, full of interesting twists, and a fairly enjoyable diversion from my ‘usual’ reading material. The vast majority of the novel is set in the city of Alt Couloumb, which is run jointly by the fire god Kos Everburning and the former goddess Justice. The city’s equilibrium is threatened when Kos dies under mysterious circumstances, and is overturned even further upon the return of the reviled legendary ‘Stone Men’. Gladstone’s world is fresh, original and dark, a steampunk-inspired blend of gods and magic and technology. I particularly liked the concept of Justice’s servants, an army of peacekeepers who, when on duty, can call upon Her power and transform themselves into the indestructible Blacksuits. 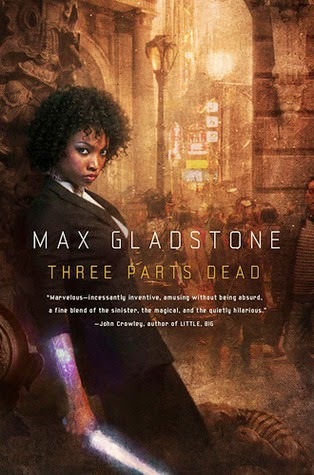 Three Parts Dead follows newly-graduated Craftswoman Tara Abernathy as she is recruited to a necromantic law firm by one of its partners, travels to Alt Couloumb, begins a series of dangerous investigations, is acquainted with new allies and old enemies, and finally reaches the unexpected climax of the legal case. Believe it or not, the main part of the story takes place over the course of a single day and night, and the series of events is pretty thrilling, despite a heavy focus on law. There are four main POV characters: Tara, the ancient and mysterious Ms. Kevarian, Cat the Blacksuit, and Abelard the novice priest. Each has their own unique perspective on the central case, and the author uses the shifting POVs to good effect, alternately keeping us in suspense and building momentum. However, the pacing remains fairly even throughout. The good thing about this is that there’s hardly ever a dull moment; the less good thing is that there are no real ‘high’ points until the end, and even the climax doesn’t quite feel as, well, climactic as it perhaps should. I also felt that there were a couple of things that served simply as convenient plot points, the vampire Raz Pelham being one of them, but I’m probably just nitpicking. The world of Three Parts Dead is built really well, and we’re drip-fed bits of information relating to its history without ever being overwhelmed by it. Even better, there are tantalising mentions of other parts of the world which are never properly explained, and some of which we never actually see, such as the scorpionkind, the sea serpents, the Deathless Kings, the wastelands of Gleb, and the Hidden Schools. It makes the author’s fictional world seem bigger and more real, despite the fact that we only ever really see one city, and also gives the impression that further books in the series will (hopefully) finally allow us to see these things.